Rock N Gold Creations offers loose diamonds, GIA Certified Diamonds, AGS Certified Diamonds, EGL Certified Diamonds and Non-Certified Loose Diamonds. Ideal Cut Diamonds, Premium Cut Diamonds and Fancy Cut Diamonds are available in a wide selection of sizes, shapes and colors. Beautiful. Rare. Cherished. Diamonds are the most sought-after gems on earth. Each one is unique. And each has specific qualities that establish its value. A GIA Diamond Grading Report gives you clear, comprehensive understanding of those qualities. As creator of the Diamond "4Cs" and the International Diamond Grading System™, GIA is not only a global authority, but the world's trusted source for unbiased assessment. Below is a detailed explanation of the GIA's "4Cs" Diamond Grading System. The color designation of a diamond is an indication of how closely it approaches colorlessness. The less color a diamond has the higher its value. Fancy color diamonds, such as pinks and blues, lie outside the standard GIA Color Scale and are not valued based on degree of colorlessness. Diamonds typically found in jewelry stores range from colorless too near-colorless. Diamonds are color-graded by careful comparison to stones of known color values under controlled lighting and standardized viewing conditions. Although each letter grade has a clearly defined range of color appearance, color distinctions can be so subtle as to be invisible to the untrained eye. But these slight differences make a big difference in diamond quality and price. Rock N Gold Creations employs GIA certified gemologists who can accurately grade and value diamonds. The GIA color-grading scale for diamonds begins with the letter D, representing colorless, and continues with increasing presence of color to the letter Z, or light yellow or brown. Diamonds form under extreme heat and pressure which often causes unique birthmarks, either internal (inclusions) or external (blemishes). Diamond clarity refers to the absence of these inclusions and blemishes. 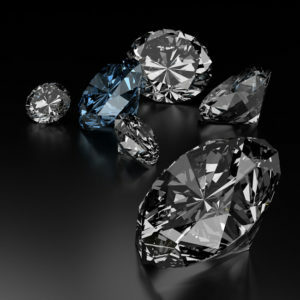 Diamonds found without these birthmarks are very rare and command a high value. Using the GIA International Diamond Grading System™, diamonds are assigned a clarity grade that ranges from flawless, designated FL, to diamonds with obvious inclusions, designated I1 thru I3. The distribution of inclusions and blemishes within diamonds make every diamond unique. None are absolutely perfect under 10× magnification, though some come close. Known as Flawless diamonds, these are exceptionally rare and most jewelers have never even seen one. The GIA Clarity Scale contains 11 grades. 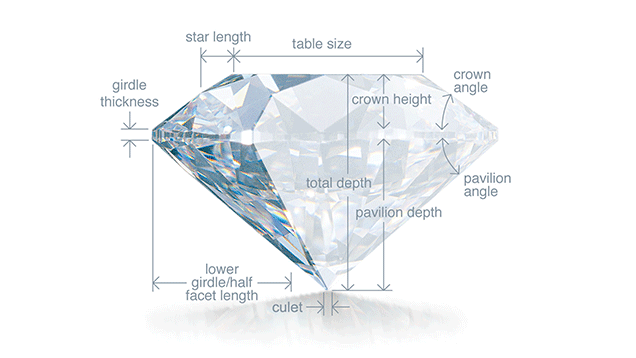 Most diamonds fall into the VS (very slightly included) or SI (slightly included) categories. The GIA grading system considers the size, nature, position, color or relief, and quantity of clarity characteristics visible under 10× magnification. Among the four “Cs” of diamond grading, the quality of “Cut” is the most important factor in producing the highest possible level of beauty and allure for any round brilliant diamond. Cut quality is the key to a diamond’s fire, sparkle and brilliance. In the GIA Diamond Cut Grading System each of these characteristics scored individually. The overall score reflects the relative importance of each individual characteristic to the overall cut quality of the diamond. Many different combinations of individual characteristics, or “proportion sets” can produce attractive diamonds. The GIA Cut Scale ranges from Excellent down to Poor. Within each grade there is a wide range of proportion sets which allows individuals to have the freedom to choose which aspects of appearance they prefer. Most diamonds used in jewelry weigh less than one carat. Larger diamonds are rare and thus more desirable and costly, but the Color, Clarity and Cut are also key in determining a diamonds value.